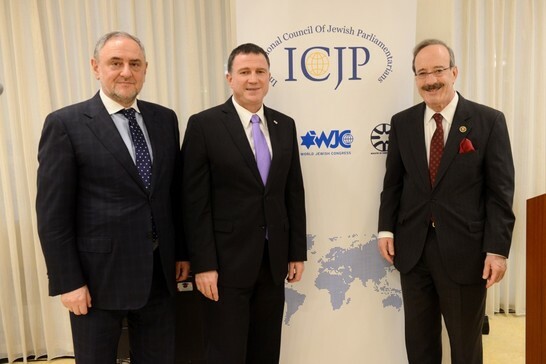 The International Council of Jewish Parliamentarians met in Jerusalem, under the auspices of the WJC for three days of intensive discussions and meetings with high-level Israeli officials. The delegation to Jerusalem, led by Chairman U.S. Congressman Eliot Engel, comprises twelve parliamentarians, from Chile, Brazil, Canada, the U.S., Belgium, France, Romania, Hungary and Ukraine. The meeting, organized in coordination with the Knesset and the Ministry of Foreign Affairs, opened at the King David Hotel with an introductory session, followed by a formal dinner at the Knesset. World Jewish Congress CEO Robert Singer thanked Edelstein for hosting the delegation, telling the parliamentarians: “You, honorable legislators, are the elected representatives of your countries. You were not elevated to public service by virtue of your religious and cultural affinity, but I have no doubt that your Jewish moral values deeply affect the choices you make as public servants." “At the World Jewish Congress, we believe it is crucial to bring together lawmakers who share many concerns and who otherwise would perhaps never meet. You are a powerful group of people, who have the ability to make real change in the world. Together, you are even stronger than you are alone,” Singer added. In his remarks to the parliamentarians and to the guests at the dinner, Engel related to the recent wave of terror and the threats of radical Islam, saying: "When you consider all these threats, it’s clear why Israel’s friendships and alliances are so important. With the United States, the EU, other countries, in South America, and the global Jewish Diaspora. For the United States, Israel is a natural ally. The only democracy in the Middle East. We must never forget that. A country that shares our values that we share here in the United States and our commitment to democracy." "And let me just say this: anyone who claims that our relationship is in danger or that support for Israel in the United States is waning simply doesn’t have their facts straight," Engel added. "Support for Israel is bipartisan, unshakable, and will remain so. It transcends any particular president or prime minister, any members of Congress or the Knesset." During the three-day meeting, the delegates will hold talks with Prime Minister Benjamin Netanyahu, MK Isaac Herzog, MK Yair Lapid, MK Naftali Bennett and MK Michael Oren, as well as with other senior members of Knesset and government.